Abstract: In this article we will take a look at HTML5 Client side storage using Local Storage and Session Storage with an example. For years, developers have used client-side cookies to store data like user preferences, order items etc. However cookies are limited in size and structure (4KB) and they travel with every request to the web server, creating unnecessary overhead. HTML5 provides two client-side storage facilities – web storage (includes local storage and session storage similar to persistent cookie and session cookie) & database storage (SQLite or IndexedDB). Using web storage, you can store upto 5 MB data at client side. This data does not travel with every request to the web server. 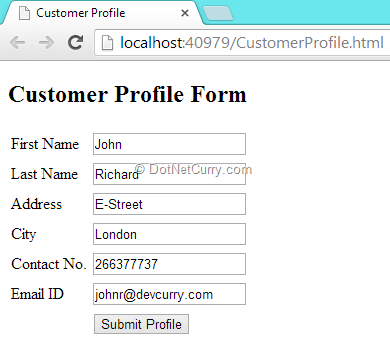 In the above function, we are creating a JSON object which holds the values filled by Customer as his/her profile. Then with the help of Modernizer, we are checking the support for local storage in the browser. If the support is there, it will store the JSON object into our local storage using a function setItem. This function allows you store the values in a Key and Value format. 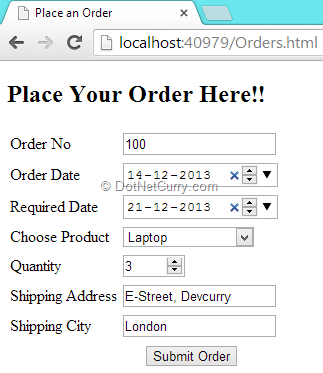 Then we use our customer Profile to fill the order form using window object. 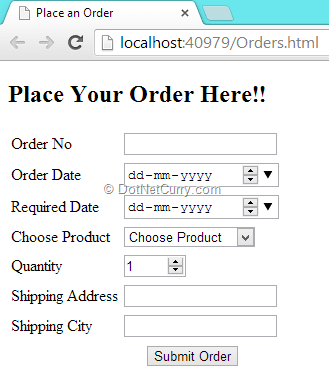 The jQuery DOM ready function will create a JSON object and will store it into our local storage. We are also calculating the total price of the product by multiplying it with the required quantity. The above code performs a check for session storage and stores the data with the key Profile. One primary difference between localStorage and sessionStorage is localStorage stores data till the application or user deletes the object, whereas sessionStorage stores data for the duration of a user’s session interaction of with a page. 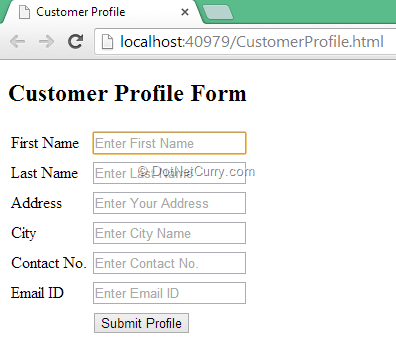 Now run your CustomerProfile.html page, fill the Customer Profile, then fill the order form and finally you will see the Cart with all the required details. And that’s how you can use Local Storage and Session Storage to store the data locally at client side.